We are one of the well-known manufacturers, exporters, suppliers, importers, wholesalers and traders of PW and WFI Storage Tanks. 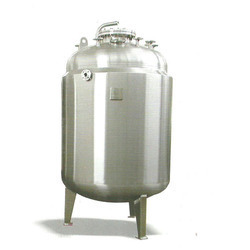 The offered storage tanks are manufactured from stainless steel. Our supplied storage tanks are available in multiple variants such as single jacket, double jacket and plain. The offered storage tanks are provided with electric insulation, for ensuring human safety. Our offered storage tanks are electro polished at all the wetted surfaces. Packaging Details: WOODEN BOX, PLASTIC BAGS,BARDHAN PACKING, PLASTIC ROLLS, ¿¿¿	All double wall for excellent support. ¿¿¿	Used for bar, plate, sheet, pipe and fittings. ¿¿¿	Boxes are then taped together using mono tape. ¿¿¿	¿¿¿ For large orders of bar, pipe or cut/machined pieces. ¿¿¿	¿¿¿ They are either nailed/screwed or banded shut. ¿¿¿	¿¿¿ Banded leaves no exposed material and provides good protection during trans ¿¿¿	Used for all sizes of bars & Pipes & pipe fittings. ¿¿¿	Sizes are 50.8mm, 101.6mm, 152.4mm, 203.2mm and 254mm x 5000mm in length. ¿¿¿	Packed with timber feet of all the above sizes. Looking for PW and WFI Storage Tanks ?